Kidney stones affect more than 1 million people each year, according to The National Institute of Diabetes and Digestive and Kidney Diseases. Much research has been done to evaluate the different options for treatment of kidney stones. The effect that kidney stones have on the lives of millions of people has led to significant improvements in the non-invasive treatment methods available. The formation of the stones occurs when the normal balance of water, salt, minerals and other substances in the urine changes. The balance of the changes determines the type of stone that develops. Factors that affect these balances include not drinking enough water and medical conditions such as gout, inflammatory bowel disease and bowel surgery which changes the way the body processes calcium. The current research and theory holds that kidney stones form when the urine contains too much of substances that create small crystals that later become stones. If a person gets kidney stones once they are more likely to develop them again later. Kidney stones can also occur in infants that are born prematurely. And certain types of the stones appear to run in families. Other types of stones happen more frequently when the individual suffers from obesity, renal tube defects, bowel disease or ileal bypass. The reasons the stones develop are dependent upon the types of stones that have developed. For instance, calcium stones are the most common. They occur more frequently in men than women and usually between ages 20-30. The calcium in the urine combines with other substances, such as oxalate, phosphate or carbonate to form the stone. In other instances the stones are formed in people who suffer from cystinuria which is a disorder that runs in families and affects both men and women. In this case a cystine stone is formed. Struvite stones are found more frequently in women who have urinary tract infections. These particular stones grow very large and can block the kidney, ureter or the bladder causing an immediate problem that must be addressed to save the health of the kidney or bladder. Uric acid stones are more common in men than women and happen most frequently when the sufferer is experiencing gout or chemotherapy. Uric acid stones form because of the changes in the pH of the body system. Today, kidney stones are often treated without surgical intervention. Either the practitioner or nephrologist (kidney specialist) will check several factors to determine the best method of treatment. One of those tests is the chemical composition of the urine. They will recommend a 24 hour urine collection to evaluate the chemical make up of the urine. This helps for immediate treatment and recommendations for diet and fluid intake to stop the formation of future stones. Often kidney stones are small enough to pass on its own at home. Drinking 2 to 3 quarts of water a day the individual stays home taking pain medication and strains the urine to catch the stone. The practitioner will evaluate the stone to assess the need for diet or fluid changes to prevent further development of kidney stones. If the stone is too large to pass down the ureter and into the bladder then the pain will continue as the muscles of the walls of the ureter try to squeeze the stone into the bladder. This action can cause damage to the walls of the ureter causing it to bleed and the urine to turn pink. When the stone is getting closer to the bladder the person may feel the need to urinate more often or a burning sensation while they are urinating. A practitioner should evaluate the symptoms the individual is experiencing and continue to monitor the progress of the stone. If fevers or chills go with any of these symptoms the individual may have developed an infection that must be treated. Only the practitioner can determine if the stone is small enough to pass through the bladder on its own or whether it should be treated in an outpatient procedure. There is ESWL or extracorporeal shockwave lithotripsy. This is a procedure that uses shock waves outside of the body to smash the stones into tiny pieces that pass easily from the body through the bladder. This treatment is usually used for smaller stones in conjunction with an x-ray or ultrasound. It is performed on an outpatient basis and the side effects are minimal. 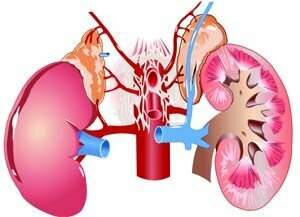 The second option is PNL or percutaneous nephrolithotomy. This is done when the first option is not successful. This is more invasive and intended to treat larger kidney stones. The urologist will make an incision in the back and insert an instrument to remove the stone. In cases where the instrument can’t remove the stone because of the size the surgeon breaks the stone into smaller pieces. This isn’t an outpatient procedure and patients remain in the hospital for a couple of days following the procedure. Third, the doctor may recommend ureteroscopic stone removal. A ureteroscopy is performed when the stone is in the ureter. The urologist places an instrument through the bladder and into the ureter. They can then remove the kidney stone with an instrument that resembles a cage or use an ultrasound shock wave to crush the stone. The last option which is the oldest of the four is open surgery. The doctor will cut you open and remove the kidney stone. To make sure that all the kidney stones are collected during the operation, you may first be injected with a solution consisting of calcium chloride, cyroprecipitate, thrombin and indigo carmine so it will be easy to remove using the forceps. Even if surgery is successful, kidney stones can once again appear in the body. To prevent this from happening, you should now take preventive measures. Once the stone has been removed and the individual is no longer in pain the practitioner may recommend such lifestyle changes as drinking more water to prevent the kidney stones from forming. Individuals should drink at least 2 quarts of water each day. That means 8 – 8oz glasses of water each day. This is the standard amount of water that each individual should be drinking to maintain good health. In the past those who commonly developed calcium stones were advised not to eat dairy products. But, recent research has indicated that eating dairy products may help prevent the development of stones while taking a calcium supplement may increase the risk of developing stones. Some dietary changes may also be recommended. You don't have to stop eating certain foods but simply limit your consumption on items like apples, black pepper, chocolate, coffee, cheese, grapes, ice cream, oranges, tomatoes and yogurt. The same goes for fish, meat or poultry products because it helps increase your uric acid. Since kidney failure has been associated with alcohol consumption, you should also cut this down as well. Those who develop cystine stones should drink enough water each day to dilute the concentration of cystine in the urine. These individuals need more than a gallon of water each 24 hours and at least a 1/3 of that must be drunk at night. There are also medical therapies used to prevent the formation of certain types of kidney stones. These medicines control the amount of acid or alkali in the urine. Allopurinol in one medication that is useful for hyperuricosuria. If the cystine stones can’t be controlled by fluids the practitioner may prescribe Thiola and Cuprimine which help reduce the amount of cystine in the urine. Kidney Stone Clear is a safe, non-addictive, FDA-registered natural remedy containing 100% homeopathic ingredients selected to dissolve and clear kidney stones. Kidney Stone Clear may be taken at the first sign of pain or discomfort, as it works quickly to relieve pain in the flanks or lower back, as well as alleviate the symptoms of sweating, nausea and vomiting. This remedy contains a selection of homeopathic ingredients known to support overall kidney and urinary tract health, without side effects. Kidney Stone Clear is taken internally and presented in a convenient, concentrated tincture formula. It is easy to ingest and hassle–free with no artificial colors or preservatives. It is safe for all ages, including pregnant women or those who may be breastfeeding. Learn more about Kidney Stone Clear now.